My chance to talk about things I like and dislike, speed cameras, political correctness, rock music, religion, persecution of indigenous people, gay issues, the environment, films, TV, life in the U.K., equestrianism,travel.. oh and me !! Can anyone tell me please "what is NOT made in China?" Everything I seem to buy lately is made in China, designer clothes, electrical goods, self assembly furniture. I recently bought a brand new Hewlett Packard computer only to find when I got it home the drive unit did not work. That is, it did not break down but didn't work from the time I plugged it in. I found out later from the box it was made in China. (surprise surprise) Needless to say, I took it back and got another unit which did work but what infuriates me is the unit must have been faulty when it was packed as it showed a fatal breakdown in hardware/components not damage to the casing or anything like that. So what happened to the quality control then? Was it a case of meeting delivery quotas and therefore packed anyway regardless of it being duff. Personally, knowing the deviousness of the Chinese I suspect this was the case. This unhealthy push towards manufacturing in China can only mean that we are sacrificing quality for cost. Look at the Mattel situation as confirmation of this. I now always ask the salesman at any store what the country of origin is for the goods I propose to buy. They often look at me as if I am from another planet, as if to say "why does that matter". Of course it matters, I don't want cheapness in exchange for quality. I think there should be a campaign among blue chip Manufacturers and they should be proud enough to state " This product was NOT made in China!". After all, for the sake of the environment we moan about shipping food half way round the world yet we are doing that with just about everything else we consume. My partner and I are just recovering from a traumatic experience at the Greek Embassy visa department in Holland Park London. I say traumatic because although there was no physical damage, mentally we were left exhausted by our experience. In order to take my partner for a holiday to Greece to celebrate our year together as Civil Partners , we had to apply for an entry visa because he is Filipino. We left a gap of seven weeks before our departure date but we were forced to wait one month or just over for an appointment at the Embassy so we had little leeway. Those who regularly visit Greece will know that by the end of September the weather becomes more unpredictable and rain can set in. We were, therefore at the extreme end of the season as we were to return on the 27 th September. Our appointment was 9.30 and as we live on the Somerset/Devon borders we had a 250 mile trip which involved driving to Woking and getting three trains. We met road works on our way and were delayed so at 9.27 we were running out of Holland Park Station and sweating arrived at the Embassy with one minute to spare to be confronted by a queue outside. Once we got inside we asked others what there appointment time was and they all were 9.30. We had just completed a most stressful last leg of our journey and at 10.15 we were still sitting waiting. There were two Greek women behind the counter, one who obviously didn't know fully what she was doing and one who had all the knowledge and kept chipping in but was not serving anyone until us, that is. The latter woman, who I can describe as a dead spit for one of the women in Robert Palmer's "Addicted to Love" music video, was rude, unfriendly, had a very aggressive demeanour and lacked the social skills to promote excellent customer service. When it was our turn, the first woman picked over the evidence carefully and the questions she asked, such as why is my partners wage slip just a piece of typed paper, was so pathetic to be unreal. I wanted to scream out, because that is what they do in some local government departments. For gods sake check the monthly amount with the bank statement and you will see it agrees. Finally, the second "Palmer" woman look a like had to get involved and opened up a second position at the counter to deal with us. At one stage, I had to leave the hall and go outside when she queried the travel insurance we had purchased from Tesco because it didn't have his name on it although there was a receipt with the start and end dates on it and the date of purchase. How do I know when it is for, she said or should I say growled. Pathetic indeed. As it turns out, they could not guarantee the visa in six working days. They said we can collect it on the Friday before the Monday if we phoned up and confirmed it had been issued and then come and collect it. Now this was pathetic as we had just told her we had driven 250 miles and it had taken four hours, so given this information could we possibly phone, drive all the way to London and collect the visa during the one hour window 12.00 - 13.00 hrs which they allocate for visa collection. Work it out yourself. As it is, if we do not get the visa by Friday of next week we have to cancel one day of our holiday, change the flight to the following day (cost £60.00), inform our accommodation in Greece and because my partner has an interview for promotion on the Monday morning, collect the visa on the Tuesday from London the day we fly out to Athens. In other words, drive 250 miles to Woking, get three trains, collect the visa, travel back to Woking pick up the car and go straight to Heathrow to pick up our flight. We are staying on a small island in Greece just 2 hours ferry time from Athens, population 1,000. They are solely dependent on tourism on that island and we are going to spend our hard earned cash there and I am sure they are grateful for that. I wonder how they would feel if they knew that their UK Embassy was doing nothing but hinder tourism for their country. I have relayed the story to some workmates and their reply was.."Why on earth are you going to Greece...go somewhere else" . They are right of course, but you know I have spent some fabulous holidays in Greece and all I wanted to do was show my partner what all the fuss about the country was. Am I wrong about Greece after all ? As, a footnote, when we pressed this "charming (sic) woman to help us and get the visa earlier, she made my partner sign a piece of paper to acknowledge that the visa was at risk if we tried to get it earlier. Now how about that then ! Oh, by the way. When I needed to renew my passport in an emergency once, I drove to Newport in South Wales and only had to wait two hours for a completely new passport. In Greek terms, they cannot do it in even seven working days. Say no more eh. Next year, Spain here we come ! If anyone else has had a similar experience , let me know and I will publish some. Something is bugging me. 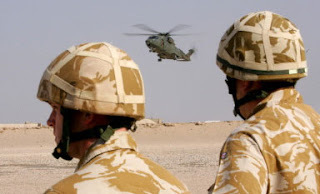 What has happened to the wounded when we report casualties in the Iraq war zone? We always hear about the dead (horrific enough) but we never hear how many are massively wounded and maimed. Why is that ? Is this a political move to prevent us, the general public, from understanding the reality of what is truely going on in Iraq and Afghanistan for that matter. For every fatality in a mortar attack there are generally dozens more wounded, some severely with life threatening injuries and many who loose limbs. They are there lying in Birmingham and thereafter if they recover, lying in Headley trying to come to terms with the loss of their arms and legs and trying to come to terms with the terrific trauma of the incident they were involved in. They are being brilliantly looked after by their masters in the Forces, of that there is no doubt but that is after all, after the event. Strong stuff you might say, but it is reality and many of these young men and women are barely in their twenties or often younger. If you heard the true cost of these wars in suffering to our troops , our children and parents, you might ask why are we there and put massive pressure to bear on this Government for a withdrawal date. Our Sons, daughters, fathers and mothers are no longer peace keepers, they are actively involved in a war situation in countries where the sole aim of the occupants is to kill them. Don't be in any doubt about that fact. Politics is sometimes a sinister business, so I guess we can only assume that the forgotten wounded are just that, in media, spin and publicity terms. . . forgotten. What a shameful situation for us to be in. The arrogant Michael O'Leary capitulates !! What do G.P's really know?